When there is a sincere desire on the part of a devotee to see Bhagavan and a determination to do so, Bhagavan helps him miraculously and meets him halfway. From the moment I decided to see Bhagavan, everything helped me. I wanted to know more about Bhagavan and his Ashram. So, I went in search of Mr. Sakhdev, who had lent me some Ashram books, at Madhavpur-Vadgaon near Belgaum and there enquired of a man who was tending cattle, about Mr. Sakhdev. Imagine my surprise when the man told me that he himself was Sakhdev! He gave me all the information I needed and confirmed me in my determination. Next, I went to Messrs. Karguppi and Navkot who had seen Bhagavan and asked them for an introduction to someone in Tiruvannamalai, who could help me. They said that no note was necessary but that I could meet Mr. Sundaresa Iyer, a local teacher there, who would help me. I noted down his name. In the beginning of 1935, I left for Tiruvannamalai and reached the Ashram at about 6 p.m., on the 3rd of January. When I entered the meditation Hall, I found nobody there except a man who welcomed me. I enquired about Bhagavan and was told that he had gone up the Hill and that he would soon return. In a few minutes he did. I offered some fruits and made my ‘pranam’. He asked whether I was Gunaji and I answered in the affirmative. After this first darshan I came out in search of accommodation. I asked the gentleman who had welcomed me who he was. He answered, “Sundaresa Iyer, teacher”. I was surprised to find that the person whom I had been asked to meet was already there to help me! I sat in the Hall before Bhagavan for about an hour or so, and found then, and ever afterwards, that Bhagavan’s mere Presence radiated Peace and Happiness and that my mind was still – becoming easy and light. When I came out, I found that my walking stick was gone. I took this as symbolic. The stick, that is, the stiffness of the ego, which is so hard and subtle, was done away with! Sohiroba further says that the life of the devotee who has no body-consciousness and no world-consciousness is completely merged in the Infinite Consciousness. Hearing this, Bhagavan was mightily pleased. He stretched himself up and in a loud voice proclaimed: “Take! Take as much as you like. ‘Get in’, ‘Get in’. ” The features of Bhagavan at that moment were a sight for the Gods to see. I shall never forget the joyful, shining features of Bhagavan at that moment. But, how to get in? 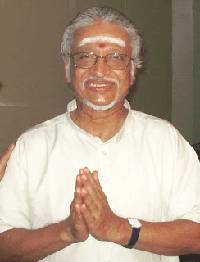 V. Ganesan is a grandnephew of Sri Ramana Maharshi. He grew up in the ashram of Maharshi and was 13 years old when Ramana died. Ganesan has devoted much of his life serving the senior devotees of Maharshi and sharing the many reminiscences he has heard, through both conversation and written accounts.